Stubble trimmers are much better than regular, manual razors when it comes to getting the closest shave possible. While razors are fine for everyday use for most people, electric stubble trimmers can shave more closely and more quickly than their traditional counterparts. We’ve taken a ton of research and put it together into this handy guide so you don’t have to spend hours finding the best trimmers. We already did! We’ll go through an overview to explain what makes a good stubble trimmer stand out from the others and share some pointers so that you can have great results every time you shave. Let’s start with a look at the general attributes of our favorite trimmers. Before we show you the best stubble trimmers on the market, let’s go over a few key concepts that will help you recognize value when you see it. Some trimmers are better than others, and if you want a quality product you’ll know to see how they score according to these metrics. Charge/Run Time: A good stubble trimmer will have a good run time in its battery. Most models these days come with rechargeable lithium-ion batteries, although a few run on disposable types. In general, you want a trimmer with enough time to handle a few good shaves before it needs to be plugged in again. This is in case your charger is misplaced or if you’re traveling with the trimmer. Aim to find a trimmer with a run time of no less than 30 minutes. All of the models were going to look at cross this benchmark. Waterproof: Waterproof trimmers are always a plus because of how much of an advantage you get by shaving in the shower. Beneath a steady stream of hot water, your pores will open up and allow you to get a cleaner shave if that’s the style you’re going for. When used with shaving cream, the results are often amazing. Trimmers that aren’t waterproof aren’t bad products, but they do lack this advantage which we really like. All trimmer should have their heads washed beneath a faucet regardless; the difference is that non-waterproof trimmers shouldn’t get their bodies wet. Settings: Trimmers can sometimes come with various settings either for their motor speed or blade length. While this isn’t strictly necessary, it’s a great thing to look for if you like to switch up your facial hair style now and again. Versatility in this area will let a trimmer keep serving you well even years down the road, whereas a trimmer with one setting is good for only one job: a clean shave. Attachments: Most trimmers come with attachments like guide combs. These are great if you don’t want to trim your beard all the way or want your stubble to be at a certain length. These can also let your trimmer double as a hair cutting implement if you find a good length that you like, although they’ll never be as good as a dedicated tool for cutting hair. Blade Type: Finally, some blades are made from stainless steel while others are made from ceramic titanium or similar material. Both types are perfectly sharp, although stainless steel is hypoallergenic and should be chosen if you have any kind of allergic reaction to metals with nickel in them. The ceramic titanium blades tend to last a long time and cut really sharply, so if you have thick hair you might want to look for a trimmer with those kinds of blades. Let’s start with a very versatile, travel-friendly trimmer that can go beyond just working on your stylish stubble. 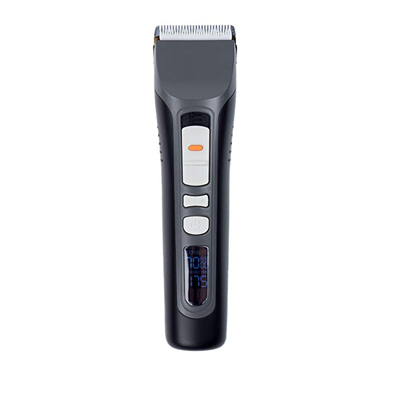 The Norelco MG7770 is a one-stop shop for all of your facial hair care needs. It can perform every task you ask of it due to its wide variety of attachments and compact carrying case for keeping everything organized. The blades for the trimmer are self-sharpening and any metal on the trimmer is a stainless steel variety; this hypoallergenic material is great if your skin is sensitive to nickel. The trimmer isn’t waterproof but cleaning the head is fine so long as the handle doesn’t go beneath the water. It charges in about ten hours for a full six-hour charge and can be used cordless or while plugged in, so you never need to go without a quick trim. There are so many attachments that it’s hard to keep track. There are several combs for beard or hair trimming, a nose hair attachment, an ear hair attachment, and more. The case that’s included with your purchase is a perfect size and quite nice. However, if you only want a trimmer to take care of your stubble or beard this goes way beyond that need. As such, its price is somewhat high. We still recommend taking a look because it’s a quality product, but it’s definitely only worth the asking price if you’re going to use everything it comes with. This is a fantastic trimmer that ‘s available for a reasonable asking price. 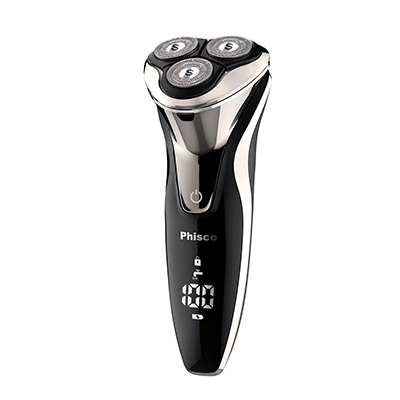 The Phisco 2-in-1 combines a shaver for your beard or larger swathes of hair with a pop-up trimmer that only requires a button press to activate. 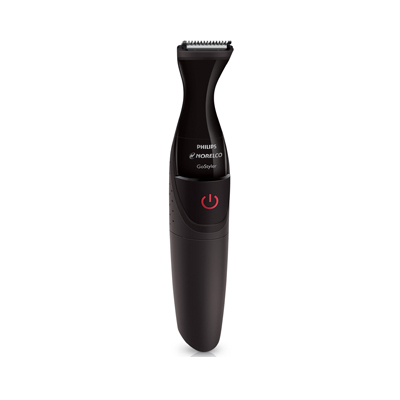 The trimmer is precise and is perfect for catching sideburns or touching up stubble around the corners of your jaw. The waterproof trimmer’s motors are really quiet while they work, preventing you from becoming annoyed at the whine that accompanies most trimmers. The entire product is really easy to hold and handle and has a great charge to run time ratio: 1 hour of charging for 2 hours of use. An LCD screen lets you know what percentage of battery you’re at. 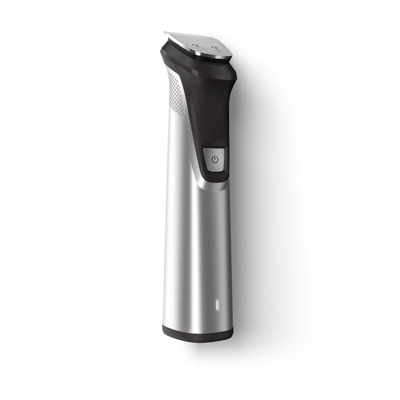 The rotating blades are designed to fit with the contours of your jaw to give you a smooth, clean shave each time. 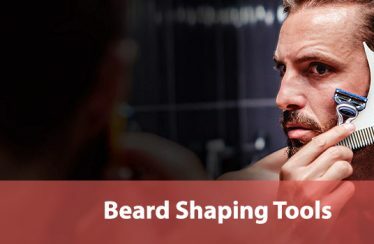 The downside to this is that a clean shave is really what this trimmer focuses on; if you want a beard or stubble with some kind of style to it, you’ll have to rely on the pop-up trimmer or look elsewhere. That being said, clean shaves are always difficult to get due to razor burn or incomplete work around the bones of your jaw. 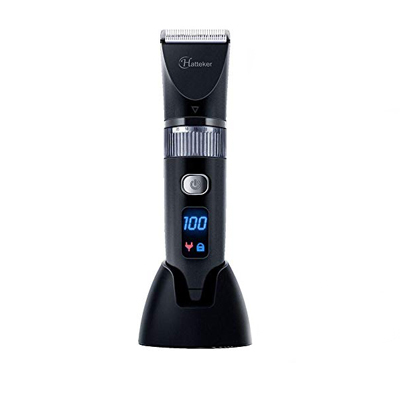 This trimmer excels at providing a close shave in a way that a lot of trimmers lack and we didn’t really notice that it was missing any spots around the chin or similarly-difficult places. For the asking price, we were impressed. This is an excellent trimmer that focuses on simplicity and an old-school approach to quality hair care. It lacks a lot of fancier aspects like a pop-up trimmer but does have a number of excellent blade guards to help you shave. 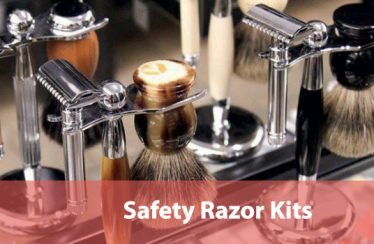 You can go clean shaven or trim to stubble or anything above with the right combination of blade guard and setting, of which there are five distinct variations. The blades are made from a ceramic material that’s harder and long-lasting than stainless steel. While this is a great feature, it does mean that in the event you need some replacement blades you’ll have to search a little harder than you would otherwise. However, since the blades last so long we can’t imagine that this is a really big problem for most people. The trimmer is lightweight and simple with easy buttons. There is a dim display at the bottom for showing battery life, which is generous and provides you with 4 hours of run time for 3 hours of charging. The trimmer isn’t waterproof but instead should have the blades rinsed carefully beneath the faucet. This is a great pick if you don’t need a million attachments or some fancier gimmicks but just want a reliable, basic trimmer with some quality to it. It’s a great middle ground between the ultimate budget pick and something with more value. The RIWA trimmer is a tool for precision. While other models have settings, few have as wide a spread as 15 distinct positions for their blades. These settings are selected via a dial at the middle of the trimmer handle, easy to reach and manipulate with your thumb. We’re glad to say that it works very well and doesn’t slip or overcorrect easily at all. The blades are self-sharpening and the trimmer is waterproof, so you can take this into the shower and give yourself a clean shave with hardly any effort. A very bright display will keep track of your current battery for you and also display your current blade length if you forget. A guide comb is included if you want to take this trimmer to thicker hair, such as your beard or the hair atop your head. This kind of versatility is great to see, and we really like that it adds so much value to such an affordable piece of equipment. Few trimmers offer so much for such a great price. We did notice that the handle tapers towards the end, which can make it surprisingly easy to drop if it’s wet or you aren’t paying attention. However, this is hardly a real flaw and such a design choice does lend the trimmer a nice, sleek look. This is something of an advanced, more premium version of the RIWA trimmer. The Hatteker model is pricier, but it too comes with a control dial to switch between the 20 different length settings of its blades. This is five more than the SIWA offered and these can combine with several different guide combs. This extra customizability really gives you some great control over your facial hair style as well as your overall hair style. The charge and run times are both really good and the display is bright and radiant. The handle for the Hatteker is a lot better and we enjoyed the slick black style. The charging stand that comes with the trimmer is compact and perfectly sized for most bathroom counters. The ceramic titanium blades that are installed on the trimmer’s head are built to last for a really long time; as before, finding replacements might be tricky but given their lifespan we don’t foresee this being a big problem. Since it’s waterproof we recommend using this trimmer in the shower with the sharp blades for maximum results. If you like the idea of the RIWA but want something more premium and with some more options, the Hatteker might be right up your alley. It offers the same kind of precise performance, just more. The Norelco GoStyler is a small, compact model that trends away from the more premium trimmer’s we’ve seen. 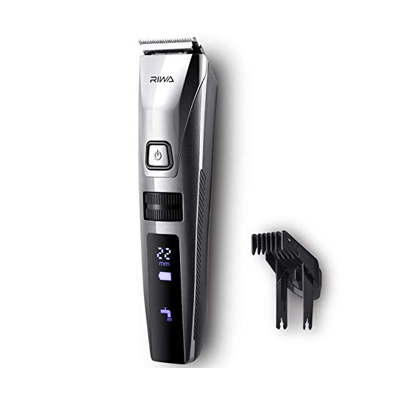 It comes with three different combs for beard length and a foil shaver that you can click on for finishing the touches of a clean shave around some hard-to-reach areas. The head is really small and precise by itself, which we really liked for trimming carefully or going for a super-smooth clean shave. DualCut blades at the top are great for shredding stubble hair that’s tough from repeat shaves or patchy areas that grow thicker hairs than normal. Putting a little pressure onto the trimmer is easy, too, since the grip is lined with a rubber surface that’s easy to keep a hold of in the shower and comfortable during use. The trimmer is waterproof but uses AA batteries instead of any kind of charger. This might be a downside for some, but depending on your needs, the small size and light weight of the GoStyler might actually be a great fit. The fact that it relies on batteries is no big deal if you’re constantly traveling and it’s ultimate portability is only enhanced by this lack of a designated, cord-based charger. If you’re in the market for a more premium product, check out the Arc5 by Panasonic. This beauty uses a five-blade head that uses a pivoting head to follow the contours of your jaw and make sure that every hair is cut cleanly. This feature combined with the sharpness of its blades makes achieving a clean shave practically a guarantee every time, especially if you do it in the shower. A pop-up trimmer lets you get the smaller, more specific areas that are too narrow to be effectively hit by the broad head. You can also work on your sideburns with this trimmer; it’s easy to manipulate since the overall handle feels great to hold. 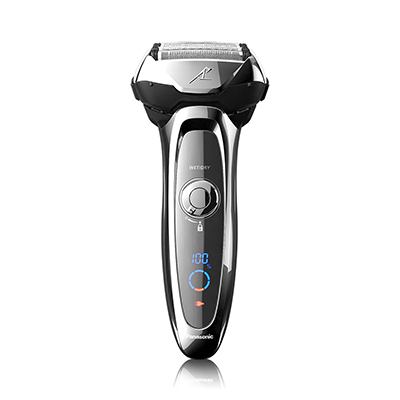 The motors are powerful and quiet, and you’ll find that a shave is finished very quickly. However, we recommend using shaving cream since the blades move so quickly that bare skin can sometimes get burned just from how effective the trimmer is at its work. The high price is a little disappointing considering its charge and run times, however. You only get 40 minutes of shaving for an hour of charging, although most people will plug this back into its cord when they’re done. Still, this limits its use for frequent travelers. 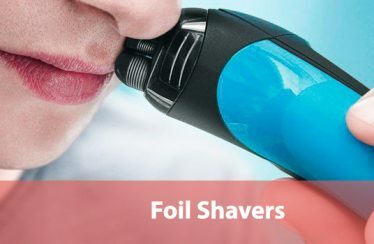 Now that you’ve found a great trimmer to help you knock out your stubble and keep a clean face, you might be wondering if there are better ways to use it than just going by instinct. Don’t worry; we can give you some pointers that let you achieve a fantastically-close shave. Heat Your Face: This is where the common advice to shave in the shower comes from. When the pores on your face are heated, they relax and expose more hair to be cut away, lengthening the time you get between stubble appearing on your skin. However, this can be accomplished by washing your face with a hot rag ahead of time if your trimmer is not waterproof. The key aspect is heat and wetness. Use Shaving Cream: Shaving cream both helps you cut your stubble more cleanly and prevents you from giving yourself razor burn. Find a good shaving cream, buy it, and use it every time you take a blade to your face! Even experienced trimmers will find that appropriately-sharp blades will nick and bite if you don’t shield your skin with some good cream. Shave Against Your Hair: If you run your fingers against your stubble, you can probably feel the way that it tends to bend. The object is to drag your trimmer against this trend; in this way, you’ll make the stubble hairs stand up straight before they’re cut. 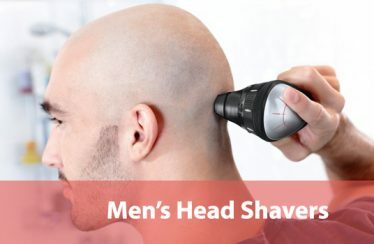 Just like with the heating tip, this will let you cut more hair at once and lengthen your clean-shaven period before you have to do it all over again. Don’t Press Too Hard: This seems pretty simple, but a lot of people really dig into their skin when they use a trimmer. This doesn’t help you cut more deeply! Instead, it just makes the skin of your face tougher if it doesn’t get cut. Since one of the biggest appeals of a clean-shaven face is its smoothness, you want to avoid making it feel calloused like the hands of a farmer. Keep Your Trimmer Plugged In: Finally, make sure that your trimmer is charging or plugged in when you’re not using it! Nothing’s worse than waking up, realizing that you need to shave, and finding out that your trimmer is totally out of battery. You’ll have to let it charge at least partially, which could take one or more hours. To avoid this pitfall, just get into the habit of storing your trimmer while it’s being juiced up. These are some the best stubble trimmers on the market today. With the right trimmer and some great pointers, you should be all set and ready to keep a clean-shaven face all year round if you prefer. The great news is that a clean face never goes out of style. Remember your shaving cream and enjoy the feeling of your own perfectly-smooth skin.